Overhead Bridge Crane | Traveling Cranes | Box Girder Cranes | » Capco Crane Engineers Save “The Bay”! Capco Crane Engineers Save “The Bay”! 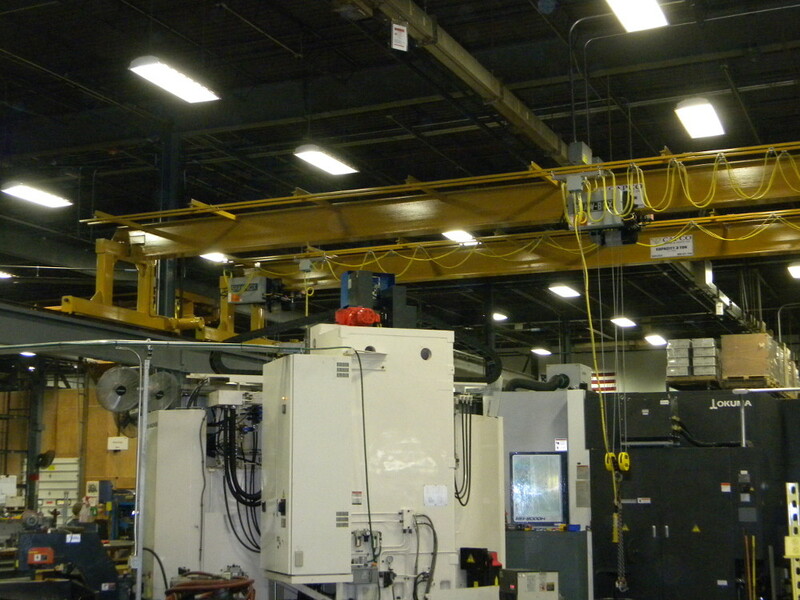 Capco Crane & Hoist, Inc. (Rowley, MA) has had many material handling challenges presented to them from customers over the years. All of that experience and engineered solutions came in a very useful way recently for one desperate customer in Central Mass. A longtime customer of Capco Crane called our head engineer, Jim couturier, as they had in their mind a specific space (the “Bay”) in their plant as an area to install new machines. 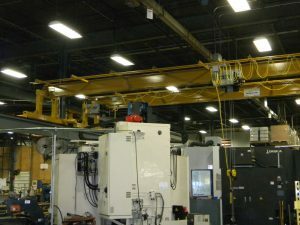 However, the existing cranes and runways were not going to quite provide the headroom, hook height, or hook coverage that was necessary for the new machines and the parts that would go into the new machine centers. The other part of the equation was that whatever solution could be found; it needed to happen in a rush as the machines were already installed and the parts were waiting to be loaded! In steps; Jim and his engineering group evaluated the material handling problem and came up with a great solution, that would save money and, more importantly, would be implemented quickly. The two key problems were that (1) the runways were too low to provide the hook height that the customer needed with standard bridge cranes and (2) the time and money to raise the runways was not going to work within the customer’s time line and their budget. So why not “raise” the cranes? The Capco engineers dreamed up a plan to provide three modified double leg Gantry cranes that would run on the same runway at the existing elevation. The solution was perfect as this design would provide the hook height and hook coverage necessary for the new parts and the new machines. The other huge benefit, instead of buying new cranes and new runways, the customer re-used the existing runways and could just install the three new cranes as soon as Capco Crane could build them. A rush was put on the job and the customer had three NEW double legged gantry cranes in place, on time and well within their budget! Capco engineers managed to save the day and save the “BAY”. Another job well done by Capco Crane & Hoist, Inc.! Capco Crane & Hoist, Inc., located in Rowley, MA, is a service organization located in the suburban Boston area specializing in the sales, installation, manufacturing and inspection of overhead bridge girder cranes and hoists. They are a member of the Crane Manufacturers Association of America and MHIA, the Material Handling Industry of America ( www.mhia.org).